Linda Dupree is an established professional in the world of fashion, beauty and style. For over twenty years Ms. Dupree has been an indispensable resource for showing women how to make a dramatic transformation in their personal and professional lives. This has made her one of the top beauty professionals in the country and abroad. Ms. Dupree has created and customized personal development classes for female executive that require a completive edge. Her keen eye for detail was a key ingredient to the ascension of her career. Her areas of expertise include: Image consultations, etiquette coaching, communications coaching, social graces and mentoring, makeup artistry, makeup services, hair styling, wardrobe development, personal shopping, fashion styling, color analysis, style analysis, wardrobe strategies. Many high-powered professionals rely on Linda Dupree to coordinate and direct their corporate photo shoots, their professional wardrobe and presentation. While in Las Vegas Ms. Dupree had the pleasure of working on the Televison show “Solutions,” Hosted by Mayor Jane Laverty Jones as her personal makeup artist hair and fashion stylist. Furthermore her impeccable style and finesse awarded her the opportunity to dress the windows of Cache’ as she worked her magic at Jose Eber Salon at Caesars Palace. Because she had an exquisite eye for what the public wanted next CP Fusao Boutique relied on Ms. Dupree as fashion Buyer and window dresser and she was depended upon to direct and style all their fashion shoots. Ms Dupree worked as a regional makeup artist and product specialist for Chanel, and a skilled artist for Bobbi Brown Cosmetics, MAC, Makeup Forever and NARS. 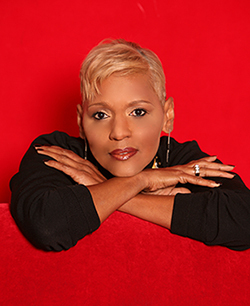 Ms. Dupree celebrity client include Usher, Tyler Perry, CNN, ABC, and NBC, some of the top names in entertainment, film, television and music industries. Her work can be seen on major retail shelves and consumer products around the world. Her work has been featured in Vogue, Allure, and Lucky Magazines. Corporate clients: Coke A Cola, Georgia Power, Rolls Royce, and Natural Health Atlanta.